Sunset at Kucheria Lake, Katun Nature Reserve in the Altai alpine meadow and tundra ecoregion of Russia. The Aleutian Islands comprise of volcanic islands and smaller islands within the United States and Russia. The islands are part of the Aleutian Arc in the North of the Pacific Ocean. The Aleutian Islands are on the northern side of the Pacific Ring of Fire and they have were battle ground during the Aleutian Islands Campaign of the World War II. The islands were known as the Catherine Archipelago before 1867 and are categorized into five groups. The Aleutian Islands experience oceanic climate with moderate uniform temperatures and heavy rainfall. The islands are major habitats for large colonies of seabirds, vagrant Asiatic Birds, and several vertebrates. Most of the Aleutian Islands ecoregion is still intact except for the introduction species such as cattle and foxes which have increased competition with the wildlife for space and food. Altai alpine meadow and tundra divides the plains and the hills of the Western Siberia from the dry basins. The mountains forming part of the Altai alpine meadow and tundra have arctic characteristics because of their high latitude. The Atlai receives an annual precipitation higher than the mountain ranges of the Central Asia and has a low rate of evaporation because of the cold climate. 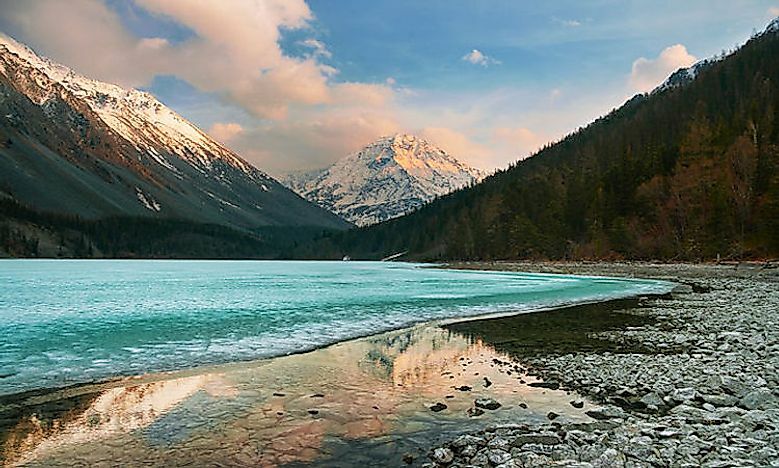 The Altai Mountain Range represents a diverse biodiversity for both plants and animals. Fungi, mosses, and vascular plants dominate the ground cover. The mammals found in this ecoregion include the snow leopard, lynx, musk deer, and reindeer. 13 species of birds found in this ecoregion are listed in the Russia’s Red Data Book. Grazing and hunting are major threats to Altai alpine meadow and tundra ecoregion. However, much of the ecoregion remains intact due to the difficulty in accessing the region. Altai montane forest and forest steppe lie between Siberia and the Mongolia steppe constituting the mid-elevation of the Altai-Sayan. The climate of the ecoregion is continental which is characterized by cold winter and warm summer. The mountain relief influences the microclimate and the temperature conditions. The ecoregion is dissected by Dip Rivers and their main tributaries. The ecoregion lies within different elevations ranging from 500 meters to 900 meters depending on the different environment parameters. The flora species of this ecoregion consist of over 800 species while some of the mammals found in this region include Martes zibellina, Talpa altaica, Vulpes vulpes, and Alces alces. The ecosystem of Altai montane forest and forest steppe has been disturbed significantly. Forests on the lower elevation have been cleared. However, large tracts of forest lie within the protected area thus they are difficult to access. Poaching is also a major threat to several fauna species in this ecoregion.